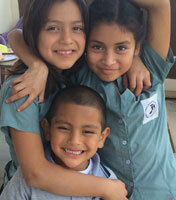 During the North American winter, we often share about the mild weather we are having here in Guatemala. When it’s below freezing there, it’s 70 degrees here. When our N.A. friends and family are complaining of snow and cold, we rub it in that we are enjoying the sun and warmth by hiking, swimming, or just relaxing. It’s all in good fun - until April hits. Then it’s not so funny. While you all are enjoying Spring time in the States, we are suffering through the end of the dry season. April is not only the hottest month, but it’s also mosquito season. I don’t know where they come from (because it’s dry season and there isn’t standing water anywhere), but boy do they come. Our garage is not fully enclosed, so walking out to start the car in the mornings is like walking through the Amazon jungle. The mosquitoes love this dark, cool place and cover our car like a blanket. It’s an adventure escaping the Amazon everyday, and a challenge to not let them inside the house (especially when the 7 year old refuses to shut the door). Back in November we expressed our frustrations about one of the judges assigned to our kids. This judge was new and inexperienced and felt that she knew best. 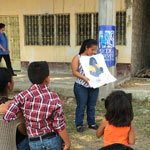 Her philosophy was that no child should spend more than 30 days in an orphanage. This led to her returning kids to dangerous situations, despite the fact that they were flourishing under our care. She even came to visit our campus. But to no avail. Her decisions were very disappointing to us and created fear and sadness that was unnecessary. So we began praying. We prayed that God would open her eyes, change her heart, and remove her doubts. And that is exactly what He did. She is now singing our praises, offering congratulations, and trying to place her entire caseload with us. She now believes that our home is the best in Guatemala! God answers prayer! Our annual school retreat was held in March. Over the course of one week, our entire school participated in camp. 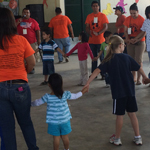 It is a time of fun, games, prayer, worship, and spiritual growth. On the Thursday morning of camp week, I sat in my office listening to our high schoolers worship God with a fervor that any church would envy. As they cried out to God and offered up praise, their lives were transformed. In all, 92 decisions for Christ were made. And many wonderful testimonies were created. The parents of these kids are giving thanks for what their kids experienced and we are giving thanks for how the Holy Spirit moved in the lives of our students. 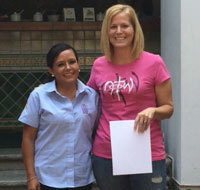 Tiffany was blessed in April to attend a week of Spanish school and while there graduated to a higher level. For the most part she can handle given situations with little or no help. Bryon however, has used Aramie to translate on two occasions and is thinking about hiring her as a full-time translator. Please pray that God will supernaturally bless him with the ability to learn and use Spanish. For those of you who know Bryon well, you know that he has a great fear of snakes. His fear is so great, that if the family were to encounter a snake while walking he would take off running while the family had to fend for itself. It’s the truth. So knowing this, you can imagine his reaction when he was told there was a snake in our house. It happened the same week that Tiffany was at language school, so he had to face the snake alone. Truth be told, he wasn’t actually alone. Two of the girls were in bed for the night, but Jaqui was awake and the one to actually see the snake first. Fortunately, she was brave enough to actually step off the stairs, go get a mop handle, and bring to the “man of the house”. Left without any options, Bryon did kill the snake, removed it from the house, and tried to go to sleep that night. Sierra has wrapped up her very successful school year (minus two exams she needs to take when we return to the States). It appears she will finish with straight As again. She also completed the Act once again and has done an incredible job. She is excited that her score was high enough she won't have to test again. After this school year, we only have one more with her. But we’re not thinking about that right now. It’s too sad. Aramie too has wrapped up her very successful school year. She has grown leaps and bounds thanks to the hard work of her teachers. We were blessed to have teaching help this year from two wonderful teachers who have been working with her. She tested above grade-level in reading, knows more than enough information about ocean animals, and is doing an amazing job in math. 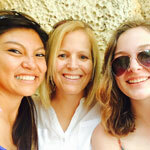 Jaqui is in the middle of her school year (doesn’t end until October) and has been able to visit various locations in Guatemala as part of her tourism study. She will soon be participating in her practicum work, which is required for graduation. 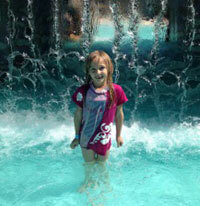 As a part of the practicum she will be working somewhere, someplace in the tourism industry. She’s praying it doesn’t require her to use English. We're so thankful to those of you that have joined us in caring for orphans and widows through your prayers and financial support. This ministry couldn't exist without your help! 3. 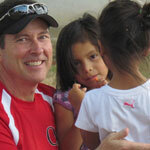 God's help as we are battling several spiritual issues with some of the children at Shadow. Pray especially for Kevin. 4. Protection for Shadow, our missionaries, and our family. Satan is at work, and some days he is working overtime! 1. 92 salvations through the camps. 2. Sierra's ACT score was phenomenal. God continues to bless her. 3. Leti's surgery was completely paid for and she is recovering well. 4. Aramie finished her school year well. Also, we found out her eye-sight has improved over the last year. 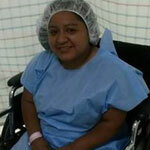 Leti was able to receive the surgery she needs to walk again. Now we are praying that she heals and that she'll be walking again by August. We recently had a medical clinic in the local area, where several of our girls (nursing students) were able to help and teach on hygiene and personal care. After Sierra's ACT, we went for a day at the Guatemalan zoo. It was a much needed afternoon of relaxation and family time. Bryon might not like snakes, but he's right at home loving on these precious children. Look at that smile!